Well, I’d never done potato-picking in my life and I couldn’t walk after a week ‘cause the back pain was so terrible. But we had to keep going. We went up the stairs on our bottom and we came down on our bottoms because we couldn’t walk. But it wore off eventually. It showed us just how hard the country people had to work. At the beginning they didn’t seem to appreciate us, but in the end they praised us like mad because we could do everything they could. You never knew when there were going to be rats in the haystack. One of our girls jumped off it when she saw a rat. I was lucky enough to never see one, thank goodness, because I would have disappeared forever! I don’t mind telling you that it was so hard after the first fortnight I honestly felt like giving it up. However, I was frightened because I didn’t want my mother and father to think they had a daughter who couldn’t do it. Their words would’ve hurt me more than staying there. Directed to your site by an item on the Newhamstory site (Newham Council Local History Site). The Land Army stories sound exactly like my Mums version, who was based in St Albans in Hertfordshire, except she blames picking Frozen Brussell Sprouts for her back problems which at 87 means she still has and is in pain everyday, so she remembers her time in the Land Army, daily! She could face a Bull with hardly a hair out of place, but Chickens were another story. She would walk the longer way round rather than go anywhere near them. 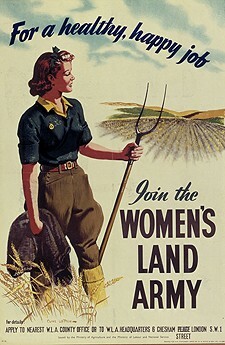 At least last year she was finaly reconised for her war work along with all the other Land Girls and `Timber Jills`. It was nice also to see the contrubition of the Black Community in Warfare which is sadly ignored in many cases. Again my Mum tells a story of a Black ARP Warden in Poplar (East London), but this is the only site which I have ever found another mention of a Black warden. Thanks for the site, very good.